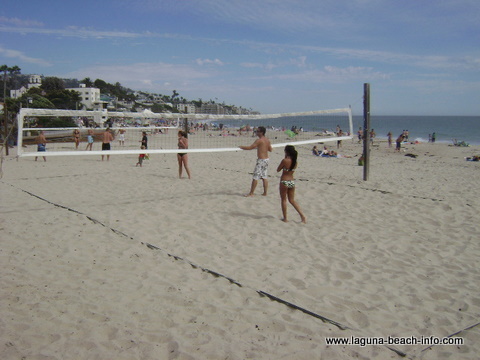 Main Beach is the most well-known of all Laguna’s beaches. Tourists from all around the world walk along the wooden boardwalk, take pictures in front of the historic lifeguard tower, and marvel at the beautiful views on this beach. 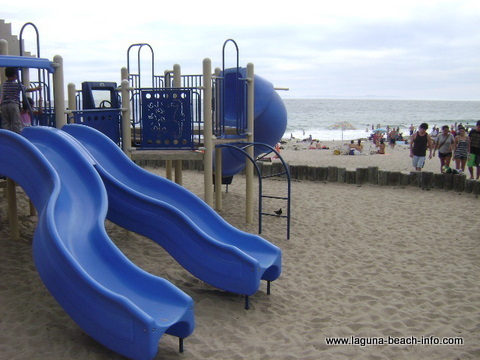 In addition to enjoying the sand, surf, and sun of Main Beach- visitors will also find- several grassy areas, a children’s playground, volleyball courts, and two half-court basketball courts. There are also two public bathrooms with outdoor showers available to rinse off sand. 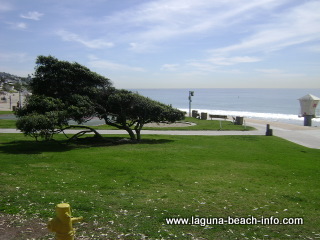 Do you have photos of Laguna Beach? (Childrens Playground) The children's playground is a great place for the little ones to burn-off more of that youthful energy! 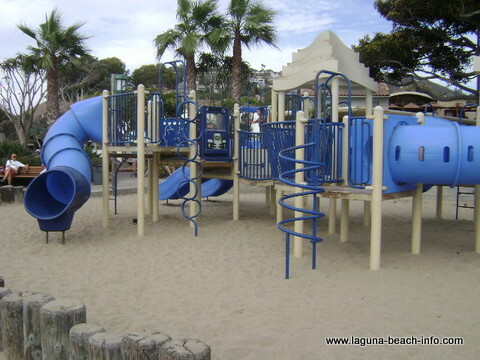 The children's playground area at Main Beach features slides, swings, and a full playground apparatus just steps from the sand! And conveniently close to a large grassy area just in case you prefer to not get sand everywhere! (Volleyball Courts) There are four volleyball courts at Main Beach, so unless there's an organized event going on, you can usually get on a court without too long a wait! During the summer, there are some really talented players that come out and play- so it's a lot of fun just to watch them demonstrate their skills! Many people enjoy just taking a stroll down the wooden boardwalk and enjoy the ocean breezes, salt air, and the sound of the waves crashing on the beach! 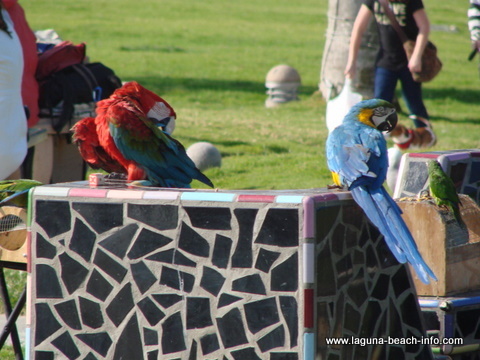 (Parrots and exotic birds) Often you'll find people bring their unique pets down to the grassy areas and boardwalk. On this day, one of the locals brought his exotic birds and brightly colored parrots. Make sure to ask before petting any animals, some have more agreeable personalities than others! 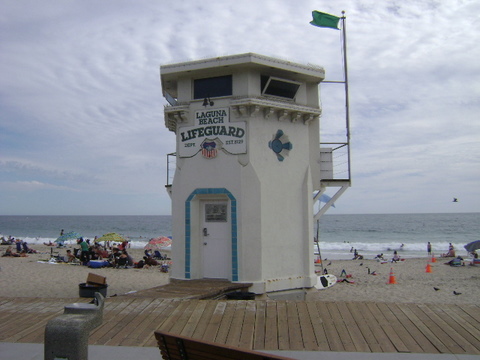 Come see the historic Lifeguard Tower. 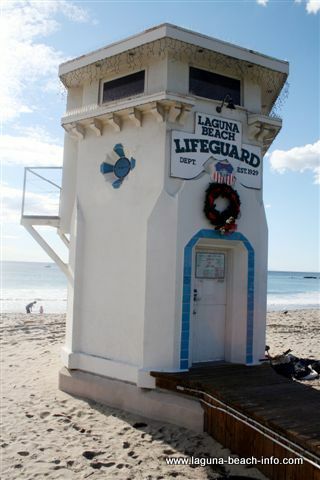 The Laguna Beach Lifeguards also post the daily statistics for water temperature, surf, and more. If you’re visiting, don’t miss the stairs on the north end of Main Beach that lead to a winding walkway up to scenic Heisler Park. Heisler Park is a large grassy park which rests upon the cliffs above several adjacent beaches, and provides beach access stairs (and ramps) down to the diverse beaches below. 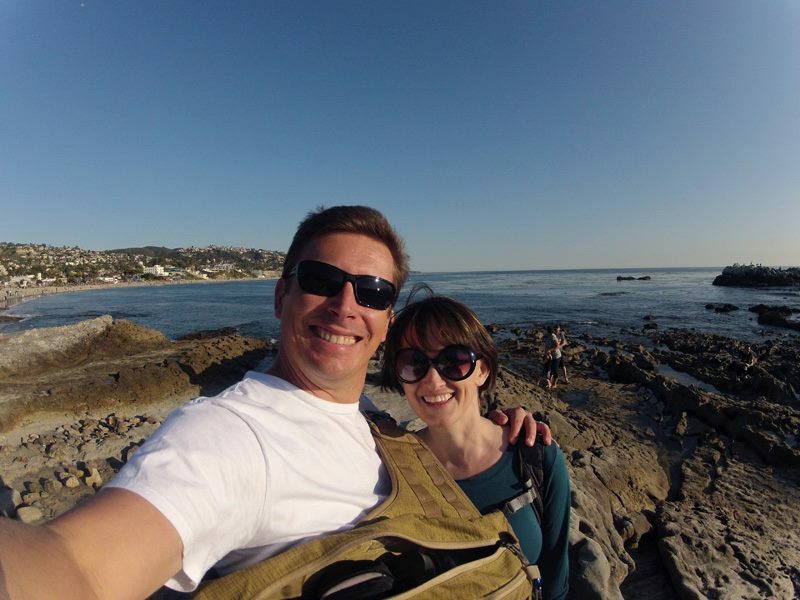 or go to the best tidepools in North Laguna at Crescent Bay Beach just a short walk away! Main Beach is conveniently located across the street from countless downtown shops, galleries, and Laguna Beach restaurants in the North end of town. If you’re spending the day at the beach and just thinking about grabbing some take-out food and bringing it back to your spot on the sand- consider BJ’s Pizza, La Sirena Grill, or Johnny Rockets. Starbucks also has two locations directly across the street. And if you love ice cream or frozen yogurt like I do- Haagen Daaz, Golden Spoon, Gelato Paridiso and Chantilly Ice Cream are also right across the street! There are also several nicer restaurants within walking distance of Main Beach. If you’re planning a dinner at nearby Las Brisas, The Beach House Restaurant, or Aegean Cafe - make sure to save a little time afterwards to take a stroll on the boardwalk and enjoy the ocean breezes on the beautiful Main Beach boardwalk. 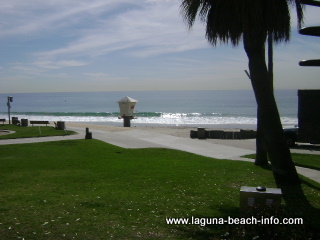 There are several great Laguna Beach hotels very near to Main Beach. There are two hotels that are located right next to the beach. On the south end is the historic Hotel Laguna, complete with upscale Claes Restaurant. 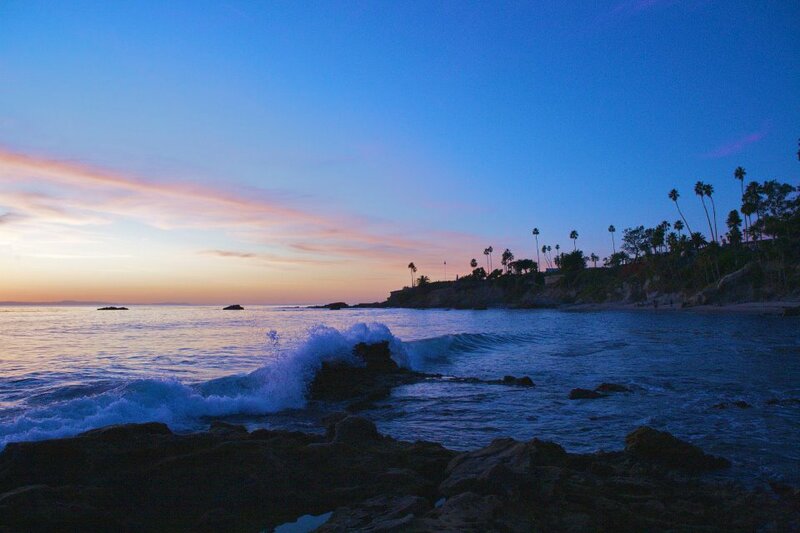 Perched on the cliffs on the North end of Main Beach you can't miss the Inn at Laguna Beach. You'll love the central location of each of these hotels! 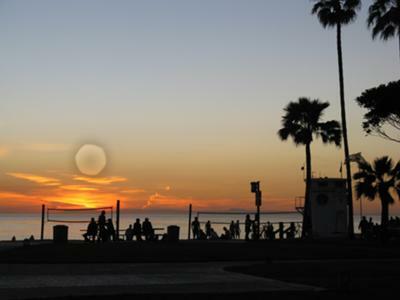 Find more great Laguna Beach hotels! There are great green grassy areas with windswept trees and palms all along Main Beach. Upload YOUR photos of Main Beach! Do you have a great photos of Main Beach? Share them here! 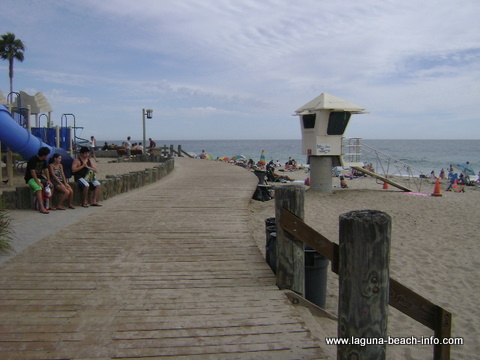 Metered parking for Main Beach can be found along Coast Highway and most side streets. There is also a pay parking lot located on Glenneyre St just south of Laguna Ave. If you don’t want to pay for parking and don’t mind walking, you can often find free parking farther up in residential neighborhoods- just be careful to not block anyone’s driveway! Return from Main Beach to the Laguna Beach beach Page.